The term audit derives from the Latin “audire”, meaning “to hear” or “hearing”. The term quality audit refers to a systematic and independent inspection with the aim of detecting weaknesses, suggesting possible improvements and checking their effectiveness. In the context of quality management, audits have the purpose of assessing processes, products and also management systems with respect to the fulfillment of requirements and guidelines. Quality audits are carried out by independent, trained auditors and according to a plan. This audit plan includes information on what is audited when, where and how. The audit is based on, for example, drawings, standards, specifications, inspection plans, inspection charts, check lists, etc. 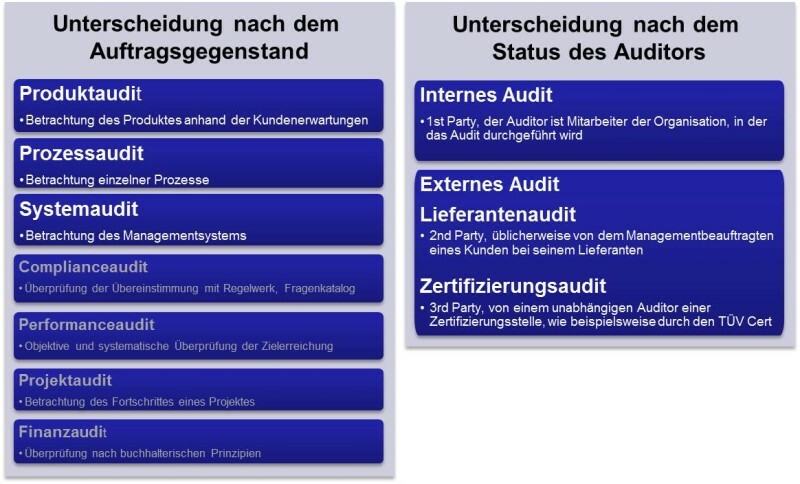 Different types of audits are distinguished by the subject-matter and the auditor’s status (Fig. 1). The 3 most important types are described in the following. Products are inspected as to whether their quality features are in line with the specifications (e.g. drawings and standards) and whether the quality requirements, in particular regarding function and safety, have been met from the customer’s or client’s perspective. This audit is used to indicate potential improvements of a process. It checks the stability, effectiveness and efficiency of a process. In addition, compliance with legal regulations, standards and process documentation is verified. In this process, the effectiveness and proper functioning of the overall quality management system of a company are assessed in order to identify weaknesses, corrective measures and possible improvements. This audit – carried out by an employee of the company – is a management tool used to assess one’s own performance. Here, a distinction is made between the supplier and certification audit. Companies use supplier audits to evaluate their suppliers, often in the form of process audits. Usually, this audit is carried out by the customer’s management officer in charge of this supplier. Certification audits are used to audit the performance of a company and its management system, this audit being carried out by an independent auditor from a certification body.